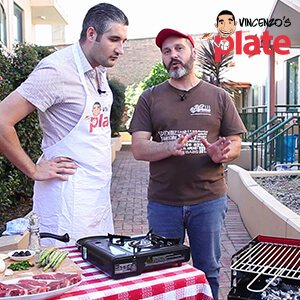 I am very excited to present this Vincenzo’s Plate brand new series, “COOKING WITH CHARCOAL”, created with BBQ expert Nick Angelucci from BBQ Aroma. Did you know that grilling on charcoal makes the meat taste incredible? You don’t get the same flavour experience on any other type of BBQ. My latest video is the first of a two-part series, where I introduce you to Nick from BBQ Aroma and one of his favourite charcoal BBQ’s, “Ferraboli”. 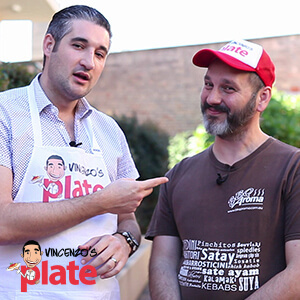 We talk about all the great reasons to cook on charcoal and this leads to part two, where you will learn how to grill a delicious sirloin steak with a special Vincenzo’s Plate sauce…and it is delicious!! Grilling on charcoal is all about the outdoor living and cooking. Using this type of BBQ is a great excuse to enjoy more time with family and friends outdoors – and it’s not as hard as you might think. 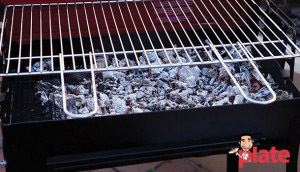 Check out BBQ Aroma’s website, www.bbqaroma.com for a great range of Charcoal BBQ’s that he delivers worldwide daily to people who share our passion for the grill. And DON’T FORGET! Stay tuned for episode 2 where we will make your taste buds dance with a tender, juicy sirloin steak, served straight from the grill..